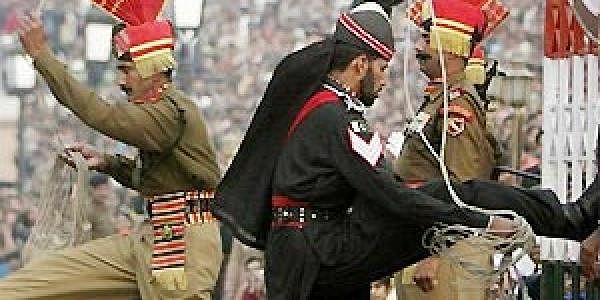 The body language of the Indian and Pakistani troopers during the Wagah retreat has become more aggressive. WAGAH: Indian and Pakistani troopers have always stamped their feet and postured in goose step as they lower their flags every evening at this border post between the two countries. Now the body language has become more aggressive as war hysteria runs high. It may not be a war zone but the euphoric patriotic sloganeering on both sides of the gate at the land border do sound like war cries. Add to that the aggressive postures of soldiers and the 'retreat' ceremony at the international border between India and Pakistan certainly looks like a war game, especially following last month's Mumbai terror attack by Pakistani &quot;non-state&quot; elements. In the two nuclear weapons states, the &quot;retreat&quot; ceremony every evening is watched by hundreds on both sides of this border outpost, 30 km from Amritsar. The ceremony marks the closure of the international border gates at the Attari-Wagah joint check post at sunset. The flags of both countries are lowered for the night at the end of the foot-stamping drill. Though India's Border Security Force (BSF) officials say that aggressive posturing by soldiers on both sides is a routine drill, they admit that the body language on both sides has changed after the latest war-mongering by both countries. &quot;In the last few days, as the tension has built up between both sides, the friendly postures of the last two-three years have gone and the stance is more aggressive now. But that does not mean that the BSF and Pakistan Rangers' officials don't talk. Things have not come to that level. The ceremony itself is going on usually without much change,&quot; a BSF official here told IANS. India has accused Pakistan of letting its territory be used by terrorist organisations like the Lashkar-e-Taiba (LeT), which is accused of the Mumbai terror attacks, and is demanding that the perpetrators be handed over. Pakistan has been in a denial mode, instead raising war hysteria to divert attention from the hunt for terrorists. While pro-India slogans like &quot;Bharat Mata ki Jai&quot; (Glory to goddess India) and &quot;Hindustan Zindabad&quot; (Long live India) are shouted on the Indian side of the border gates at Attari, slogans like &quot;Pakistan Zindabad&quot; and &quot;Jaan Jaan Pakistan&quot; rent the air on the Wagah side in Pakistan. The number of Indian visitors coming to watch the ceremony every evening is three to five times of that on the Pakistani side, as ever. Loudspeakers blare out patriotic songs on both sides to build the frenzy. &quot;This is such an amazing experience. I think every Indian must come and see this at least once in a lifetime. It gives you such a patriotic feeling. And coming to see all this in such troubled times is like a pilgrimage for us,&quot; Kolkata resident Sumit Chatterjee told IANS. People on the Indian side have again become wary of Pakistan after three to four years of bonhomie between both countries. &quot;In recent years, things were so normal. Now suddenly there is tension,&quot; said Jasbir, a porter on the Indian side, who is used to carrying goods across the border checkposts. The two countries have fought each other in 1947, 1965 and 1971 followed by the Kargil conflict in 1999.